Trump’s surprise Nov. 8 election triumph also sent the Mexican currency to record lows in a sell-off fueled by his threats to scrap a trade deal between Mexico and the United States, and to levy punitive tariffs on Mexican-made goods. Goldman Sachs economist Alberto Ramos said in a client note the weak peso fanned the remittance surge, noting workers could be “strategically front-loading” transfers to avoid potential taxes or restrictions from the incoming U.S. administration. The value of the remittances considerably exceeds that of Mexico’s oil exports, Ramos noted. Mexico’s central bank governor Agustin Carstens said last month that a rise in remittances was due to a weak exchange rate, more U.S. jobs and fears over Trump’s policies. Mexico’s government said in November that it is ready to lobby the U.S. Congress and use all legal means possible to stop Trump blocking remittances. Thailand’s baht held gains and an exchange-traded fund tracking the nation’s shares rose after the Royal Household Bureau said King Bhumibol Adulyadej, the world’s longest reigning monarch, had died. The iShares MSCI Thailand Capped ETF climbed 1.8 percent to $67.95 in New York, trimming its loss this week to 7.8 percent. Thailand’s SET Index has fallen 6.1 percent this week, with 30-day volatility on the gauge climbing on Wednesday to the highest level since January. The baht reached the lowest since January and at one stage was heading for its worst week in a decade. The SET rose 15 percent in the first nine months of the year, the most among Southeast Asia’s major gauges after the Jakarta Composite Index. Stocks entered a bull market in July and reached the highest level in 15 months in August as economic growth accelerated and emerging-market assets rallied. Equities had also been aided as stimulus measures to help shield the country from China’s economic slowdown made the nation’s shares a haven for overseas funds. Foreign investors have poured $3.8 billion into Thai equities this year, the biggest inflow in Southeast Asia, according to data compiled by Bloomberg. Global funds pulled more than $950 million from Thai bonds in four straight days of selling, heading for the largest weekly outflows since May 2013. The nation’s 10-year government yield rose 11 basis points this week to 2.32 percent, the highest since January. The nation’s bond market had been struggling even before the king’s health spurred further declines, as higher oil prices threatened to spur inflation and prompting traders to price in chances for a Bank of Thailand interest-rate increase. Thailand’s sovereign notes have slumped 2.1 percent in the past six months, compared with gains of more than 6 percent in India and Indonesia and a 2.9 percent advance in Malaysia. Southeast Asia’s second-biggest economy may grow as much as 3.5 percent in 2016 from 3.2 percent last year on the government’s accelerating spending, according to the National Economic and Social Development Board. Prime Minister Prayuth Chan-Ocha, who took power in a May 2014 military coup, has issued a series of economic stimulus measures valued at more than 645 billion baht since September 2015 to help shore up local demand.Soo Hai Lim, investment director at Baring Asset Management (Asia) Ltd. in Hong Kong, says there’s a potential buying opportunity. “Ten years ago, the yuan could hardly go out of the country. But now China’s opening-up and huge economic size has made it more and more popular in the international market,” said Lu Jian, vice president of Guangdong Guangken Rubber Group Co Ltd. Early this year, Guangken Rubber launched a US$270 million bid for Thailand’s Thai Hua Rubber, the world’s third-largest rubber producer. The company then sought loans from domestic and overseas banks, with some offering to fund its bid in yuan. The acquisition in yuan helps reduce foreign exchange risks as well as fund-raising costs, said Lu. “Ten years ago, all our overseas business was conducted in the US dollars and we often did not have yuan clearing banks. It’s quite a different scenario now,” he said. Today, China has 21 overseas yuan clearing banks across the world. “Despite the fluctuations in the exchange rate, the international market has not lost interest in the yuan and on the contrary, global demand is increasing,” Lu said. On Friday, the IMF announced the launch of its new Special Drawing Right basket, including the yuan, effective from Saturday, saying it was a “historic milestone” for China, the IMF and the international monetary system. Now, the yuan accounts for the third-largest share of the new SDR basket with 10.92 percent, following the US dollar’s 41.73 percent and the Euro’s 30.93 percent. “The yuan’s inclusion reflects the progress made in reforming China’s monetary, foreign exchange and financial systems and acknowledges the advances made in liberalizing and improving the infrastructure of its financial markets,” IMF Managing Director Christine Lagarde said. The yuan has moved into the top 10 but still trails the other major currencies, according to the Bank for International Settlements. Created in the 1960s, the “Special Drawing Right” is a unit of account used by the IMF as a foreign exchange reserve asset and is not a freely traded currency. To help manage financial crises, the IMF issues loans to member countries denominated in SDRs. In July 2009, China approved pilot program for cross-border trade settlement in yuan, embarking on the internationalization process of the currency. 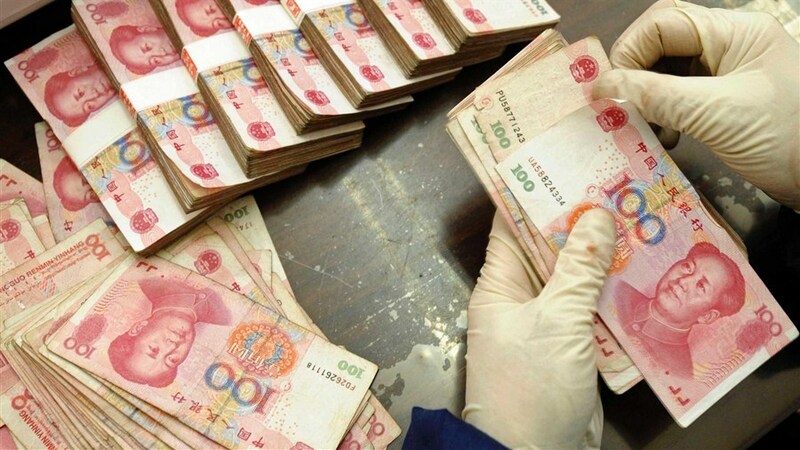 The yuan was the fifth most active currency for global payments by value in July, with a share of 1.9 percent, an increase from 1.72 percent in June, according to data from global transaction services organization SWIFT. China’s central bank said on Saturday that the country will continue to push forward financial reforms and market opening after the yuan’s inclusion. Zhang Lijun, a partner with Price Water House Coopers China, said the yuan’s inclusion was of similar significance to China’s joining the World Trade Organization. “The two cases also have shown that China helped to improve rather than topple global rules and this has positive significance for the coordination of global economic governance,” said Zhang. China’s Slowing Economy Is Still Far More Robust Than That Of The EU Or The U.S.
CHINA’S foreign exchange reserves fell to the lowest since 2011 in August as the central bank intervened to support the yuan as it weakened to near-six year lows. While the US$15.89 billion drop was in line with market expectations and was described by analysts as modest, it was the biggest fall since May and could signal fresh capital outflows from the economy as it starts to show signs of steadying. China’s reserves fell to US$3.185 trillion in August — the lowest since December 2011 — from US$3.20 trillion at the end of July, central bank data showed yesterday. China’s reserves, the largest in the world, fell by a record US$513 billion last year after Beijing devalued the yuan, sparking a flood of capital outflows that alarmed global financial markets. But declines have slowed sharply in recent months as authorities tightened capital controls and cracked down on forex trading which is suspected to be speculation. Traders believe the central bank has stepped in via state-run banks since mid-July to slow the pace of depreciation in the yuan, which has weakened 2.6 percent against the US dollar so far this year. Analysts expect pressure on the yuan and reserves to continue as expectations of another US Federal Reserve interest rate hike this year support the dollar. “With a Fed rate hike likely before the end of the year, the authorities will have their hands full with containing any wild spikes in USDCNY triggered by capital outflows, and can expect FX reserves to remain on a downward path through to the end of the year,” said Chester Liaw, an economist at Forecast Pte Ltd in Singapore. Is China’s Economic Policy A Copy Of Wal-Mart’s Economic Policy? When I was in college a decade ago I learned that in the U.S. that Wal-Mart, (Sam’s Club) (Lowe’s) (Walton family) had one dollar out of every nine dollars going through their hands each year according to the GDP. This is great if you are a person that holds a whole bunch of Wal-Mart stock, or is it? That would depend on if you are a person who loves this country, or if you are a person whom does not. I learned back in the mid and late 1980’s that the Wal-Mart slogan of them only selling American made products was a total lie. Back then I drove a truck for a living and when trucks going into the docks of North New Jersey to pick up loads going to Wal-Mart Distribution Centers it was a normal thing that the material we were to pick up would be staged on the docks waiting to be put onto the trailers yet we would have to wait for several hours to get it loaded. The reason was that the dock employees first had to remove all of the stickers saying where the products originated, like China, and then put on stickers saying “made in the U.S.A..” In my opinion Wal-Mart grew the way it did through lies, deceptive marketing, and fraud. I really liked radio commentator Paul Harvey a lot, I really liked listening to his stories, the only trouble I had with him was that he was very naive. He used to talk about how we couldn’t have a better neighbor than when your community got a Wal-Mart store in their town. We the people and the small business people of these towns knew better. When a Wal-Mart store moved into a town pretty much all of the small store and all of the ‘Mom and Pop’ store quickly got put out of business. When this happened then the town’s people pretty much ended up having to shop at that Wal-Mart store or travel long distances to places that didn’t yet have one. Do you remember how it used to be a normal thing for a new Wal-Mart store to be built across the street from a K-Mart store and how then most of those K-Mart stores went out of business? Wal-Mart did finally quit the lies about only buying made in America products as we the people learned that we were buying items laced with poisons, they didn’t have American companies to blame it on, they had to come clean to the public about where the products really came from. In most cases it was coming from China. This poison was in may things, like baby food, pet food, and the pain on children’s toys. Many other U.S. companies are guilty of these actions as it is they whom closed their factories here in the States and Canada so that they could reap higher profit margins by using the much cheaper labor markets in Asian countries like China. If you noticed when a company moved their factories to a cheap labor market when those products showed up on store shelves here in America the prices did not go down for the consumers. The game is all about profit margins. As companies here in North America put our workers on the unemployment lines destroying our own country, China started to boom. Wal-Mart had multiple half a billion dollar cargo ships (made in China) built that are too large to go through either the Panama Canal or the Suez Canal. These ships were built to sail from China to the west coast ports of North America. For Wal-Mart it is a win-win situation as they do not have to pay other companies to haul their freight for them. Just like they are phasing out their own truck drivers and started contracts with the lowest bidders, it is about maximum profits, period. Folks, when we buy products that are made in China we are putting money into the Chinese coffers and raising our dept to them. How much longer will it be until the Chinese Government calls in the loan on the 13 trillion dollars we owe them? How much longer will the dollar be the world standard-bearer? How much longer until the world currency is China’s Yuan (Renminbi (RMB))? Have you ever went around your local stores and checked where the products were made? Is it any wonder that now the U.S.Congress is trying to pass a bill making it where the people aren’t even allowed to know where the meat they buy comes from? Wal-Mart years ago got rid of the grocery packers forcing the customers to load their own groceries. Then they started putting in self checkout isles for the purpose of getting rid of the register checker employees. Last evening on the news I heard where they are now going to be replacing almost all of their office people with computers and robotics. If you have no employees you have higher profits, not lower priced products! It is no wonder to me that as the U.S. is declining and that China’s military power along with their Leaders arrogance is increasing. Yesterday in China at the G-20 conference did you see how disgracefully and how arrogantly our President and his personnel were treated by the Chinese Government and their Officials? President Obama and those with him were treated as enemies, not as trading partners or as friends or even as someone they hoped to have as a friend someday. Yesterday the Chinese Government, (and you know damn well that their President Mr. Xi Jinping okay-ed those actions, they treated our President and the people of our Country as though He (President Obama and Us) did not deserve any courteousness. Yesterday the Chinese Government basically took a piss in the face of our President and our Nation! Folks, every time you or I buy an object here in the U.S. (OR ANY PLACE THAT IS NOT IN CHINA) we are putting bullets in their guns that they will use against the U.S. and against the rest of the world. For years their policy has been to make things for the foreign markets as cheaply as possible. The ideology is simple, play on the greed of the people and companies in the open world markets. This gives work and wages to their own people while taking jobs away from other countries, closing up their factories and their industrial center capabilities. This also takes tax revenues away from other Nations making it impossible for other countries to afford to buy or build weapon systems even for self-defense. Just like with Wal-Mart ideology of putting everyone else out of business so that they rule where people can buy any product and what that price it is allowed to be, China is using that same philosophy. Pretty soon China will enforce its domain over the South China Sea and they will give Taiwan the option of surrender or be blockaded from all outside trade and revenue. They will do this as Russia weakens NATO’s resolve to their west, just like Turkey (a NATO country) is dividing NATO via courting Russia, the EU, and the U.S. concerning the Kurdish people. How many fronts are the people of the U.S. willing to go to war with? Russia believes they can break NATO and China believes that the U.S. does not have the will to go to war with them. As China makes the U.S. weaker economically, they believe they make the will of our people to go to war weaker. Unfortunately I believe that these actions will come about in less than one decade. Wal-Mart has used China well, or, is it that China has used Wal-Mart well?